Tensorcom, a leading provider of ultra-low power 802.11ad WiGig semiconductor and system solutions, has achieved WiGig certification for its TC60G1316UE System-In-Package (SiP). The SiP, based on Tensorcom’s TC60G6504UE Nant1 802.11ad SoC, that brings robust, gigabit wireless connectivity to power-sensitive devices that demand high-performance. 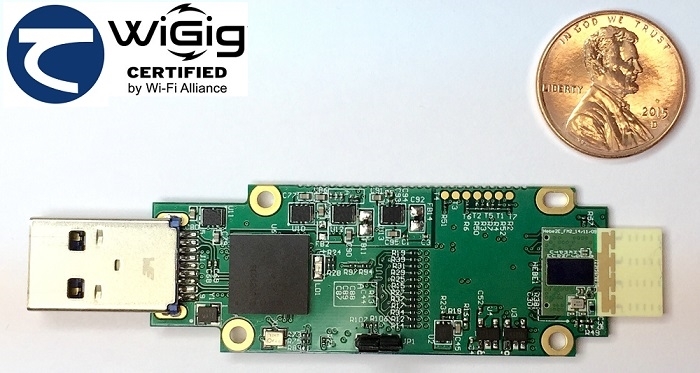 With ABI Research studies forecasting more than one billion WiGig chipsets to be shipped by 2021, the WiGig certified Nant1 solutions by Tensorcom are ideal for products that demand high bandwidth wireless connectivity in a small package. WiGig can be used for a wide range of applications from wireless docking, multimedia streaming, high speed data transfer between devices, and networking applications. Tensorcom has also announced the availability of two USB 3.0 adapter reference designs based on the Nant1 solution. The TC60G1422AE and TC60G1422CE reference are optimized for cost-effective manufacturing and support USB Type A and Type C connections, respectively. Each design includes a high performance end-fire antenna that enables reliable multi-gigabit speed connectivity and includes all necessary hardware components, production ready firmware and drivers, detailed schematics and related documentation needed to develop a complete USB 3.0 WiGig adapter for embedded or accessory applications. Tensorcom has also announced availability of two new USB 3.0 adapter reference designs based on the Nant1 solution. The TC60G1422AE and TC60G1422CE reference are optimized for cost-effective manufacturing and support USB Type A and Type C connections, respectively. Each design includes a high performance end-fire antenna that enables reliable multi-gigabit speed connectivity and includes all necessary hardware components, production ready firmware and drivers, detailed schematics and related documentation needed to develop a complete USB 3.0 WiGig adapter for embedded or accessory applications. Tensorcom will be demonstrating the new technologies at the Taipei Nankang Exhibition Center during Computex 2017 event from May 30 - June 3, 2017.